It was before my time, but I’m sure some of the Black and Gold remember the date – Nov. 1, 1966 – All Saints Day. The scene was set on St. Charles Avenue, inside the Ponchartain Hotel. NFL Commissioner Pete Rozelle stepped to the microphone, and announced that the New Orleans Saints would become the NFL’s 16th franchise. A love was born – the Saints and the city of New Orleans grew up together, loved each other, fought each other, but always held onto one another. The family suffered through losing season after losing season, scrapped its way into mediocrity and changed the tide in the mid-2000s. Many losses were followed by franchise changing victories, culminating in the 2009 Superbowl victory over the Indianapolis Colts. The Saints have played roughly 750 regular season games and the true believers were there to watch it all – the highest of highs, and the lowest of lows. The fans have seen the missed opportunities, failed draft picks, bad coaches and washed up free agent signings. They have also seen the last second victories, the unexpected successes of undrafted free agents and the glory of a free-agent signing from San Diego. The Saints fan had likely thought he or she had seen it all – but then they saw something else. The Giants strolled right into a buzzsaw in the shape of Drew Brees this past Sunday. Brees, stepped out onto the Superdome’s turf and went to work in such a fashion, that folks were pulling out the record books at halftime. The Giants opened the game with a touchdown drive that saw Isidore Newman High’s Eli Manning toss a two-yard touchdown pass to, fellow Newman High graduate, Odell Beckham Jr. The Saints got the ball and quickly marched across mid-field, and then went deep, which would be a recurring nightmare for the Giants on this day, with a flea-flicker from Brees to Willie Snead for the tying score. Brees would later hit Brandin Cooks for a 26-yard TD, then Marques Colston on a 53 yard TD pass, and once again hit Snead on a two-yard touchdown pass. Manning, not to be outdone, would add two more touchdown passes. 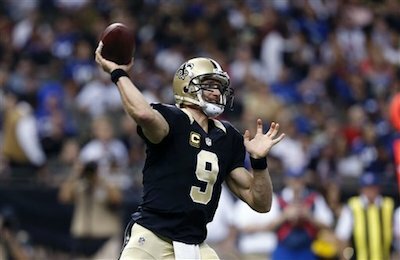 In true gunslinger fashion, Brees and Manning would both throw three more touchdowns in the second half; including Brees connecting with Benjamin Watson on a 20-yard TD, and Manning connecting with Beckham, Jr. for a third time on a 50-yard bomb. Benjamin Watson would end the day leading all receivers in catches with 9 for 147 yards. Tackle the running back when the offense ran the ball, because why would they run the ball in a game like this? Get back to passing! On offensive plays that didn’t work, it was up to the defensive backs to keep the drive alive with either a defensive holding call, or a pass interference. Make the highlights look cool by chasing the receiver who blew right by them. And after all of that, it was tied – 49-49. The Saints defense would make its stand, forcing the Giants to punt with under 30 seconds left in the game. A punt that Marcus Murphy would return to mid-field, and fumble, leading to another great catch by Willie Snead, who recovered the ball on a bounce, and promptly got face masked, setting up a 50 yard field goal – which was made by Zach – just kidding – Kai Forbath in his first field goal attempt with the football club, to give the Saints a 52-49 win. The Giants and Saints set an NFL record for 13 touchdown passes combined in a game. Drew Brees tied a single-game record for most TD passes in a game with seven. The two teams combined for 101 points in a game – third best in NFL history. Eli Manning threw his 274th touchdown pass, which moved him past Joe Montana into the 11th spot on the all-time list. Drew Brees threw for 5 touchdowns for the tenth time in his career – an NFL record. Odell Beckham Jr’s three touchdown catches gave him 19 TD receptions in his first 20 games – which places him 2nd, only behind Randy Moss (20), in the record books. As always, New Orleans knows how to throw a (birthday) party. Happy belated Birthday, Saints! So, what did you do on your 49th birthday party? Smash any records? The latest incarnation of “How The West (and SEC) Was Won” takes place this weekend in Tuscaloosa, as the Louisiana State University Tigers take on the Univesity of Alabama Crimson Tide with first place in the SEC West on the line (yes, yes Ole Miss – we know you’re in the running too). Both teams are in the top 10 – The undefeated Tigers come into the game ranked 4th in the nation, while the one-loss Tide enters the match ranked 7th in the nation. Both teams rank in the top 20 in Total Defense – the Tide clock in at number four, and the Tigers are 18th. Unfortunately for our friends from Alabama, only one team has Leonard Fournette. Also, if you don’t think the Tigers are ready, here is how they were rolling back in the summer. They’re ready. The pride of Lake Charles – the McNeese State University Cowboys – head into their biggest game of the year as well. The Cowboys face the Bearkats (yes with a “k”) of Sam Houston State in a clash for first place in the Southland Conference. The Cowboys, after a rain out against LSU, are undefeated at 8-0. The Cowboys avoided a classic “trap” game last week, winning 15-13 at Abilene Christian. The Bearkats are 6-2, but on a six-game win streak, and smashed the same Abilene Christian ballclub, 49-21, two weeks ago. This is a team that also put up 45 points against the Texas Tech Red Raiders to kick off the season.